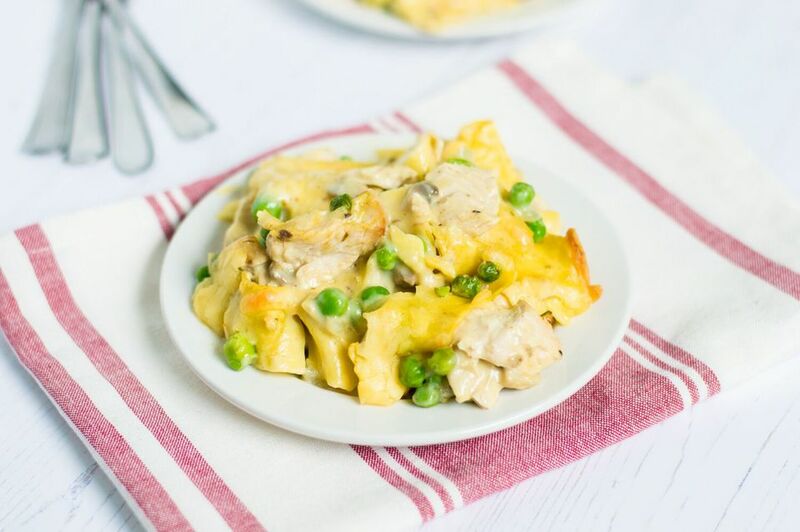 Turkey noodle casserole is simple to make and is a great way to enjoy turkey left over from holiday meals. Cook the noodles in salted water, according to directions. Drain, rinse in cold water and add to a large mixing bowl. Melt the butter in a saucepan, and sauté the onions over medium-low heat for about 3 minutes. Add the flour and continue cooking, stirring, for another 2 minutes. Whisk in the milk, mushroom soup, salt, and pepper, and cook stirring, until the mixture begins to simmer and thickens. Add the cooked sauce to the bowl of noodles, followed by the turkey, peas, and half of the cheese. Mix with a spatula to combine. Pour the mixture into a 9x13-inch buttered casserole dish and top with the rest of the cheese. In a separate bowl, mix the breadcrumbs and olive oil until combined and spread evenly over the casserole. Bake for 35 minutes, until bubbling and browned.